Up Close and Personal Skin Care Routine! 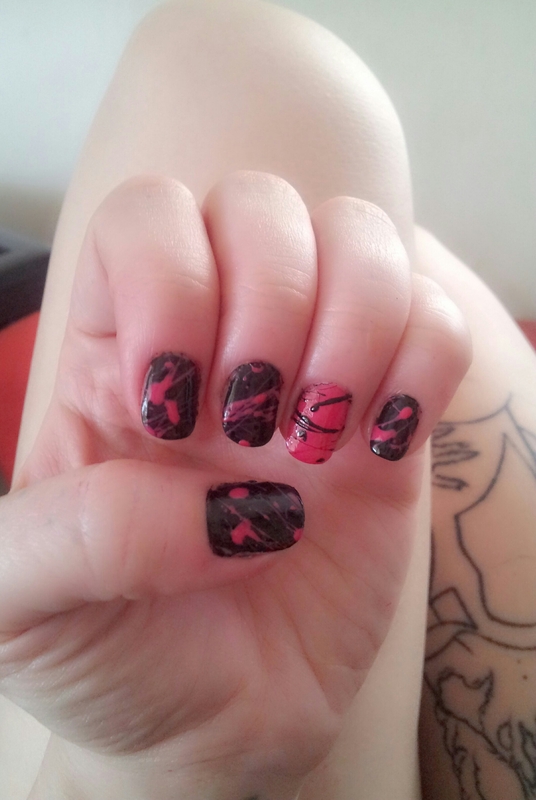 Splatter Mani: Hellooooo 80s Inspiration! So I tried a splatter mani for the first time today, and I’m really happy with the results! I had to do a tea bag wrap on two of my nails, as they had snagged. If you don’t know how to do one of these, scroll down beneath the pictures of the splatter mani for detailed instructions. I wrapped two of my nails, my thumb and my ring finger on my left hand, let that dry, and then buffed each of my nails. I have a four sided buffer that is just amazing. Don’t leave home without it! Here’s a link to the one I use. You can get it at Walgreens for about $1.50. I applied my usual base coat, Sally Hansen Double Duty Base and Top Coat, and allowed it to dry. On my left hand, I painted my thumb, index, middle and pinky fingernails with Sally Hansen Hard as Nails Xtreme Wear Nail Color in Black Out. I used this color on my right hand, but only on my ring finger. While waiting for this to dry, I applied Wet n’ Wild Wild Shine Nail Color in Lavender Creme. It’s actually a pretty spot-on match for Barbie pink. It’s very bright, and goes on opaque in two coats. It’s very thin, but surprisingly durable. I got it on sale the other day to use with my gradient sunset nails, which I’ve yet to do. Shame on me. I reapplied the polish to each nail, let dry, and then applied my Double Duty as a top coat. At this point, I thought my nails looked alright, but I decided I wasn’t quite done. I got out my nail polish thinner, OPI Nail Lacquer Thinner, which can be purchased at Ulta for around $9.00. I poured a few drops of the Lavender Creme into a small dish, and then splashed in one tiny drop of the thinner on top of it. Using a separate nail brush, I stirred it together. The thinner you make it, the less opaque it will be on your nails, although it will be much easier to get on. 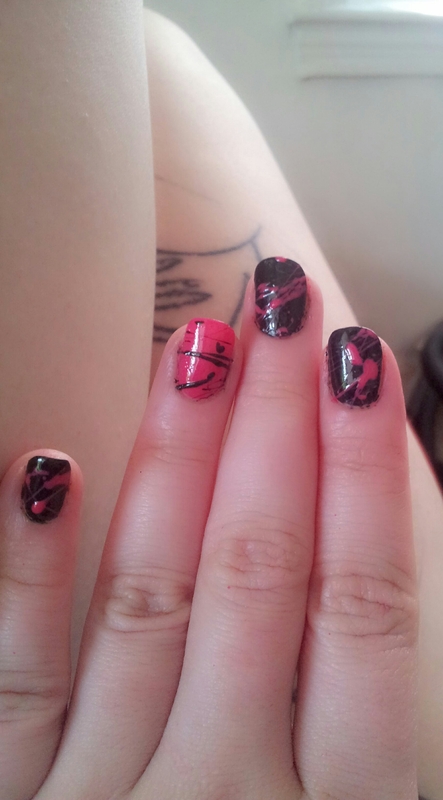 I then held the brush over each finger and tapped the end of it, making the paint splash down onto my nails. A good thing to do is put Vaseline or tape over the parts of your hands/fingers that you don’t want to have covered in paint. Because I didn’t do this, I spent half a bottle of nail polish remover and about an hour cleaning up my legs, arms and hands. I’m messy. Sue me. After this, I did the same with the Black Out nail color on the remaining nails. I then applied another coat of Double Duty and let dry. Here’s the finished result! What do you think? Alright, so you remove whatever nail polish is currently on your nail, being careful not to aggravate the break any more than it already is. Take the tea bag, and cut off the top. Remove the guts and possibly make a cup and drink that while you’re working, because yum. Also, waste is bad. Bad, bad waste. Cut a small strip out of the bag, about enough to go halfway down your nail, that will cover the whole surface. Apply your base coat to the nail, and while still wet, position the strip of tea bag across it. Push down, making sure you get any and all bubbles and wrinkles out. It might get a little messy, but that’s okay! Then apply another thin layer of top coat to kind of glue the whole thing down. When the top coat dries, take the fine grain side of your nail buffer and file in one direction all around your nail, so that any excess tea bag comes off. Apply one more layer of top coat, and let dry completely. Then, following the numbers on your buffer, file all over the surface, so that there is no visible difference between where the tea bag is and where your nail is. Voila! Pain over the top, and your nail is repaired! It will look a little bit different than your natural nails, of course, but it’s nothing a good layer of polish can’t fix. I use this all the time and it saves my life. I work too damn hard for these pretty nails. So I’ve been cranky all day, and wanted to make myself feel better, so I figured I’d do my nails. Either it would look bad and I’d laugh or it would turn out awesome (lol) and I’d be stoked. My nails never turn out very good, (unless I’m doing wraps) but I still love doing them. 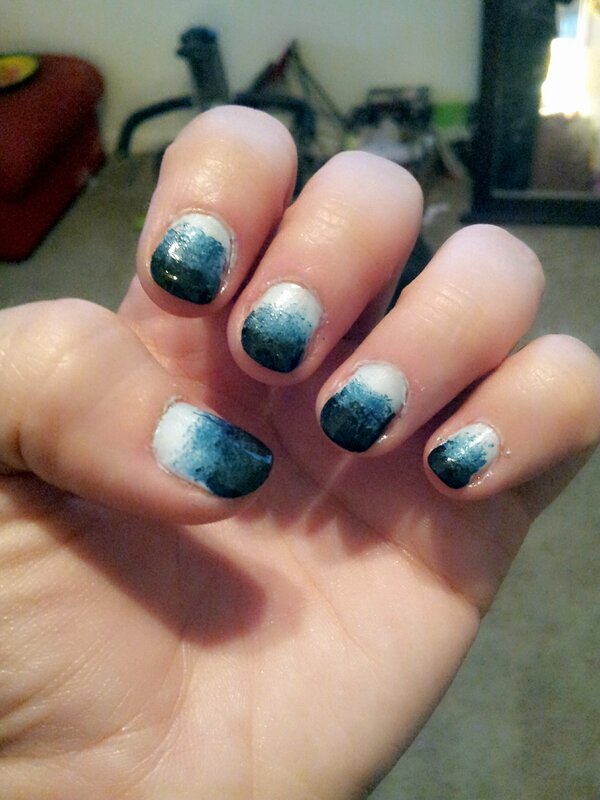 I figured I’d try an ombre manicure. It looks hard as hell, but everyone swears it’s simple. I bought makeup sponges for this last week, but I’ve been feeling intimidated. Also, I’ve tried out a couple different wraps in that time! So I decided on light blue as a base, with dark blue and black above that. I started with Sally Hansen Double Duty Top/Base Coat. Then I used Sally Hansen Hard as Nails Xtreme Wear in Breezy Blue. I applied two coats and let dry completely. I learned a rad way to see if your nails are dry is to lightly touch them to each other. They may feel dry with your finger, but if they’re still tacky when touched together, wait! You may already know that, but I’ve always thought it was useful. I then painted a thin layer of Layla Magneffect in 07 Metallic Sky onto the makeup sponge in a line. I sponged it off once onto a paper towel, and then lightly tapped it about two-thirds of the way down my fingernail. I repeated this on all of my nails and let them dry completely. 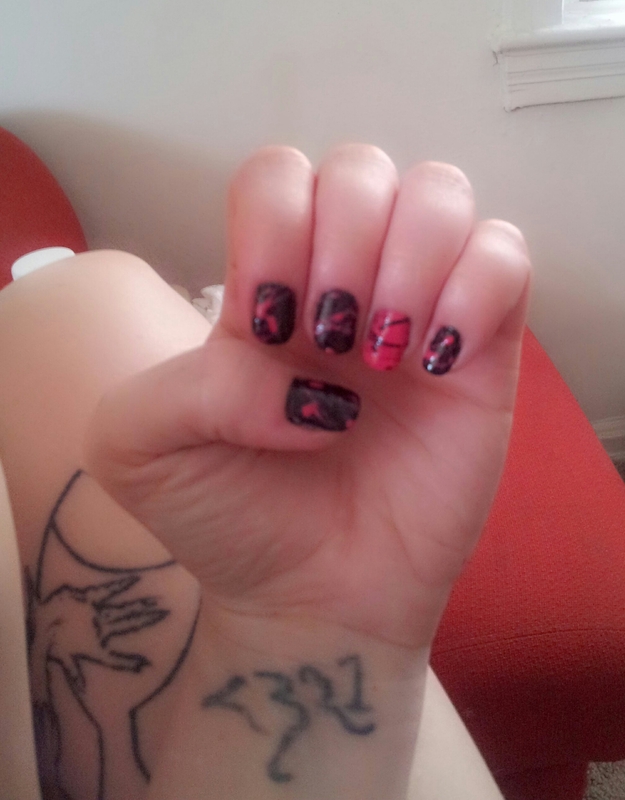 Then I took Sally Hansen Hard as Nails Xtreme Wear in Black Out and did the same thing. I painted a thin line onto a clean part of the makeup sponge, and went down about one-third of the way down my nail. I repeated this on all of my fingers and allowed to dry. I then used my same Sally Hansen Double Duty Top/Base Coat to seal it. Well, I’m kind of stoked. That’s probably the closest I’ve ever come to having my nails look like something I’ve seen someone else do. I think with practice, I’ll get better. It was pretty simple, and I like the way it looks. Anyways, it did cheer me up. I’m no longer cranky, hooray! How have your ombre nails turned out? Do you have a preferred sponge type? What’s your favorite color combination? I’d love to hear from you!